HAPPY THANKSGIVING FROM THE DIVE TEAM! 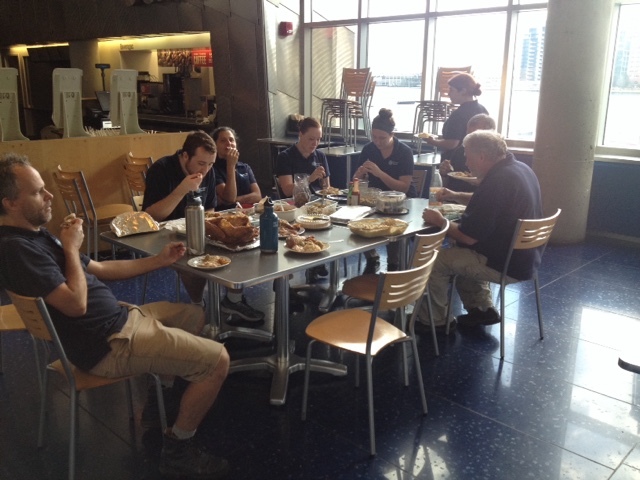 Here's a glimpse into a day in the life of Thanksgiving at the Aquarium (we are closed today). 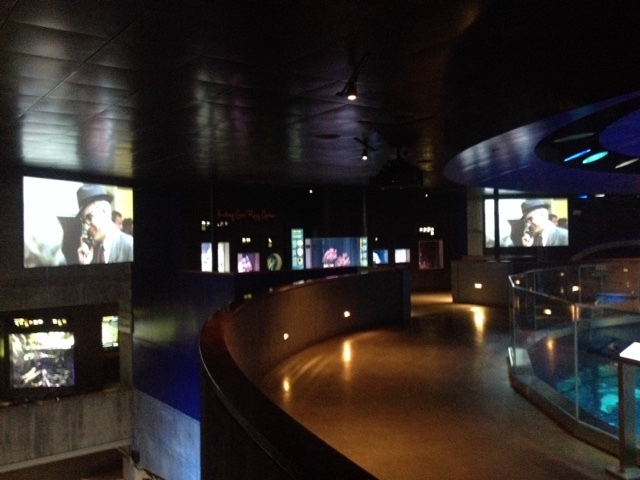 movie on the big screens at the top of the GOT! "Planes Trains and Automobiles"
Like them or not, many families will sit down to a big bowl of Brussels sprouts at their Thanksgiving feast this week. That's a dish right up Myrtle's alley. Brussels sprouts are her favorite vegetable! Since the Aquarium is closed to visitors this Thursday, we treated the 550-pound green sea turtle to a pre-Thanksgiving feast of a stalk of Brussels sprouts, along with another favorite—squid. Myrtle normally isn't served sprouts on the stalk so this experience must have been interesting for her. Fortunately, I was in the water to help her when she seemed to have a bit of trouble with it. But even sprouts on a stalk weren't intriguing enough to keep her interest once the squid was introduced! 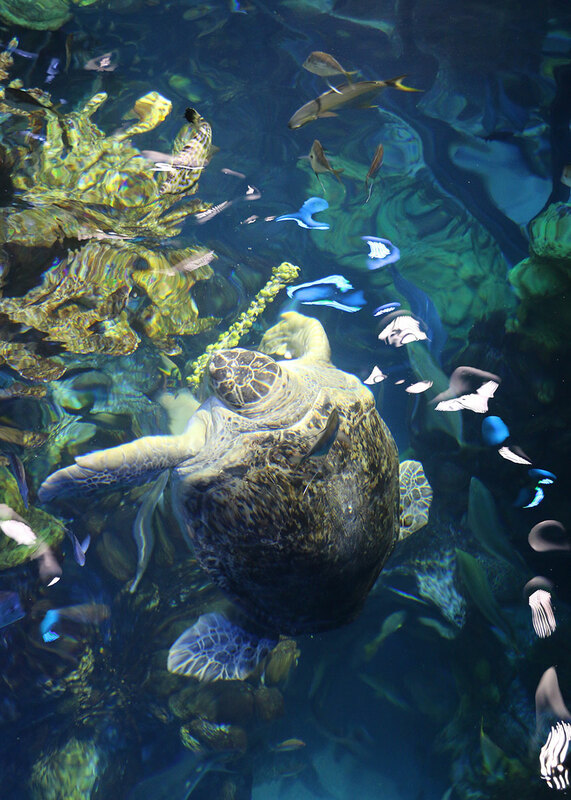 Myrtle has been celebrating Thanksgiving at the Aquarium since 1970. 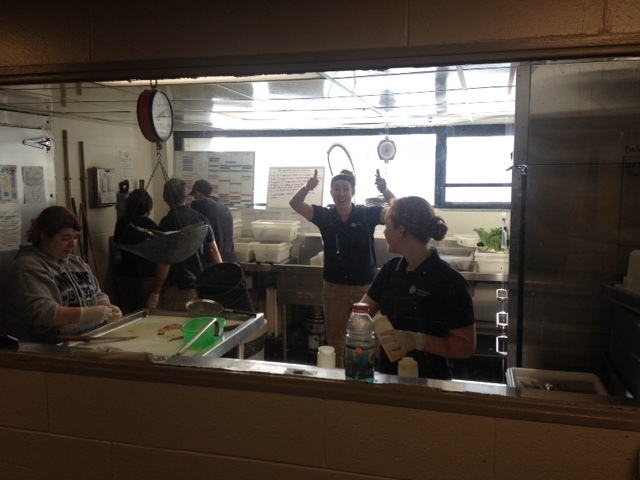 And like every year before, the divers will be at the empty Aquarium taking care of the animals and making sure they get their own Thanksgiving feasts, too. Hope you and your families enjoy a delicious and happy Thanksgiving! Following up on my last post, I wanted to introduce Toby, our smallest trunkfish, who is a very curious little fellow. Toby was very nervous during his first couple weeks in the big Giant Ocean Tank, but is settling in nicely and has gotten comfortable with the mammals in the tank: the divers! Our annual census is right around the corner, so I thought some fish ID would be fun. In this post I want to introduce our boxfishes (family Ostraciidae) which includes 4 species in the Giant Ocean Tank. These guys are unique because of their bony box of armour - you may also see one of these species in the "armoured tank" in the Tropical Gallery on the 1st floor. 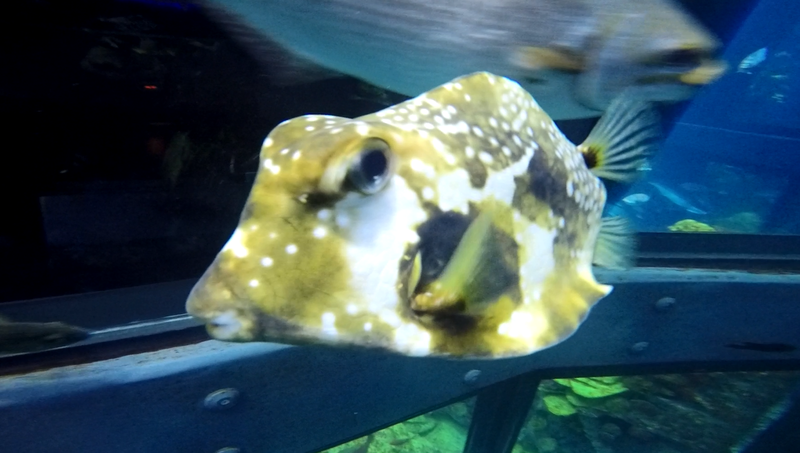 In our GOT, our boxfishes get their own special feeding station which helps them eat without competition from some of our more aggressive species. More on that station in a later post. The boxfishes are divided up into 2 groups: cowfishes, which have a spine over each eye; and trunkfishes, which lack these spines. 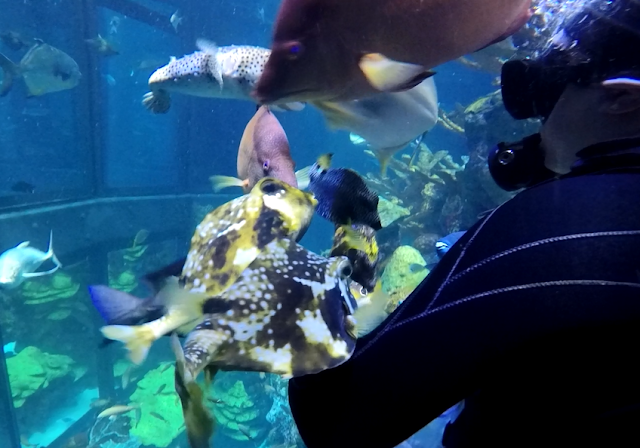 And here's a pic of some of them harassing a diver for some food! Can you spot the boxfishes? We posted about boxfish feedings a while back, and it's adorable. Here's a peek at the feeding, more video soon! 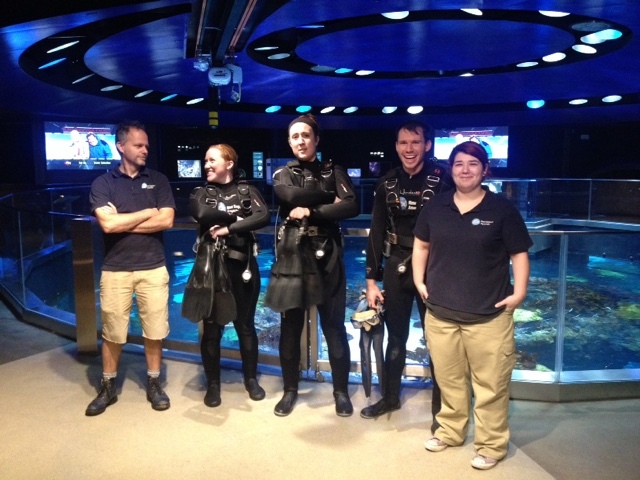 Diving in the Giant Ocean Tank with stingrays and sea turtles and eels is a thrill. But sometimes the most memorable moments don't involve animals at all. 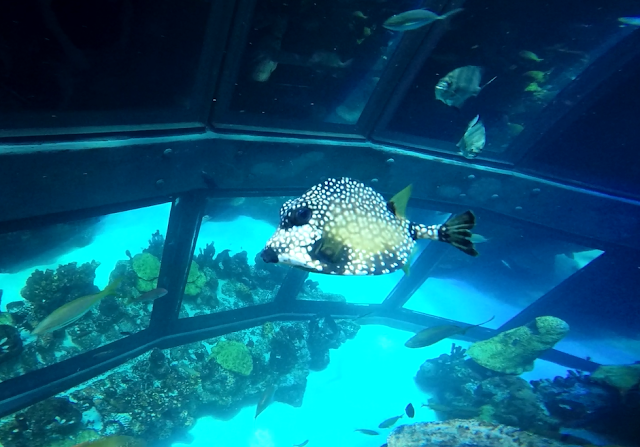 They involve the captivated individuals on the other side of the glass—so yes, the divers can see you! Sometimes those enchanting connections are felt on both sides of the glass. 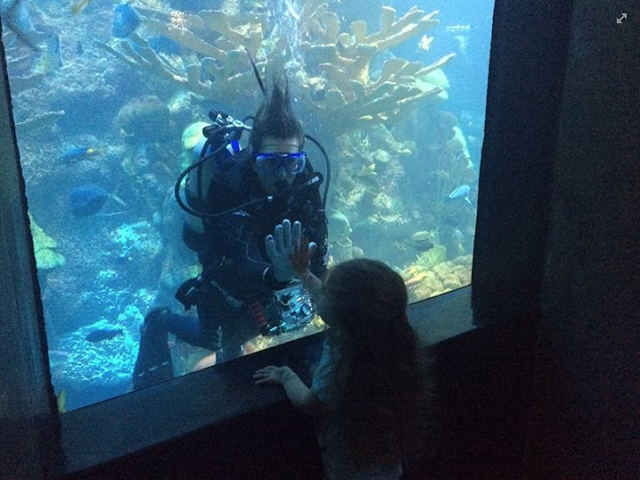 We were immediately bowled over by this touching moment shared via Facebook by visitor Lynne Mailhot. 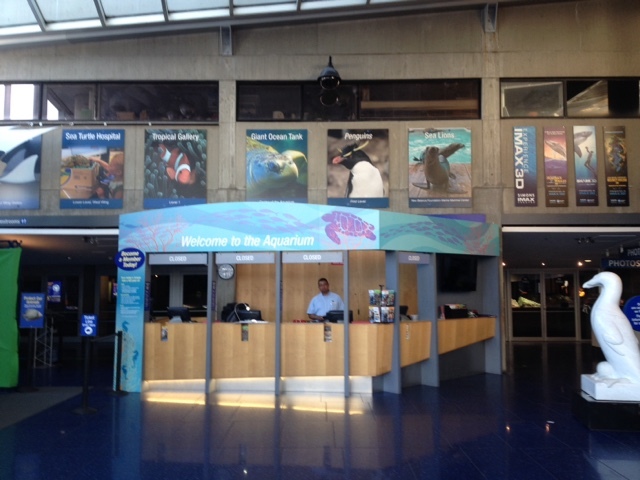 Lynne Mailhot wrotes, "My 3-year old had an amazing time at the New England Aquarium today!" 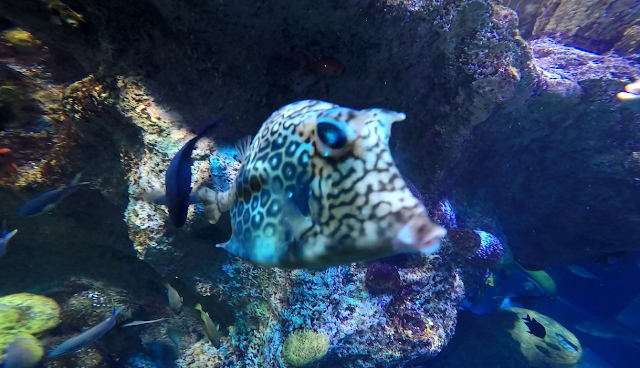 Lynne wrote, "My 3-year old had an amazing time at the New England Aquarium today! Special thanks to the diver who took the time to interact with her while we were watching the fish in the Giant Ocean Tank. Our daughter was in awe and it made her day! :)"
The diver was professional photographer Esther Horvath, who is working on a long term documentary project called Baby Giants about the conservation efforts for endangered sea turtles. 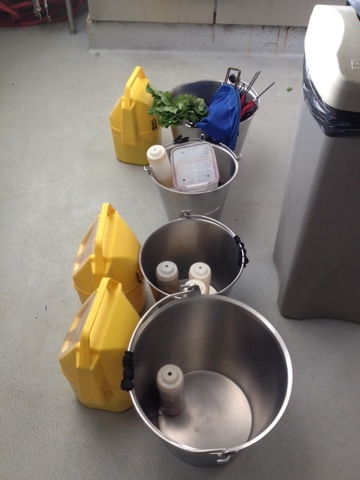 You can see some of her work on our Rescue Blog. She was in the tank to photograph our loggerhead sea turtles, both rescues that came through our Rescue and Rehabilitation Dept. 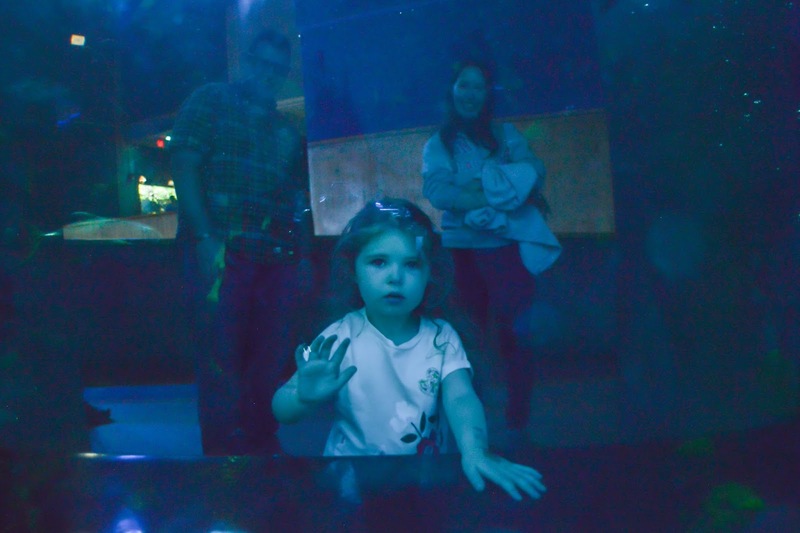 From the perspective inside the tank, Esther writes, "She was so-so cute, looking at me for a long time, and we touched each other's hands through the glass window." These two images tell a story of a special moment shared on both sides of the glass. 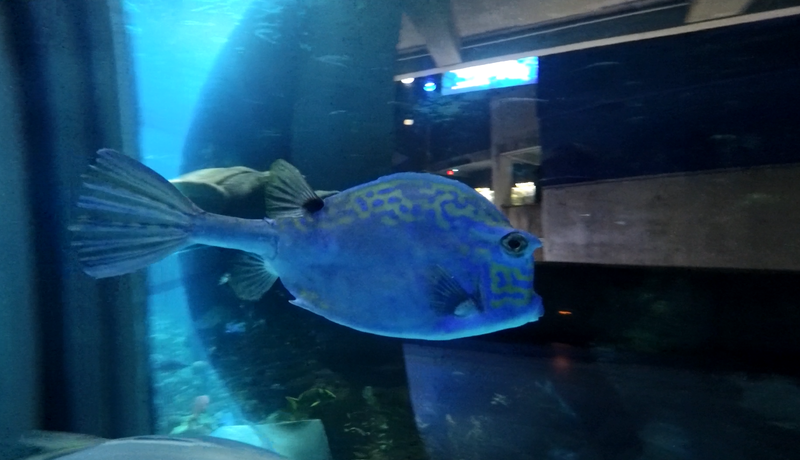 It's connections like these that inspire us here at the Aquarium. Maybe a young visitor connects with a diver and will grow up to be a scuba diver, advocating for the protection of wild reefs where they dive. 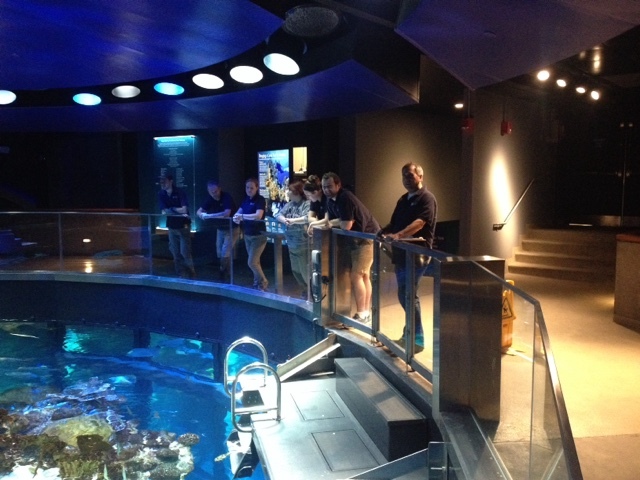 Or maybe a visitor is captivated by an animal and will go on to study marine science in school. Whatever the path, we hope to engage visitors—young and old—and motivate them to become future ocean protectors. Thank you for exploring our blue planet with us, Lynne and Gabriella! 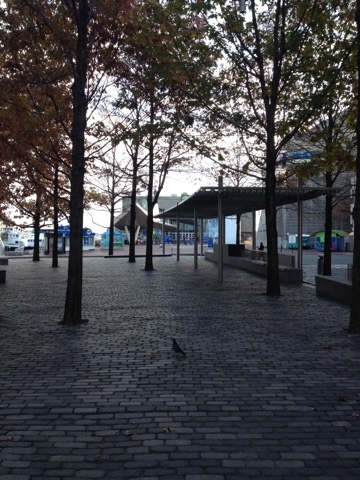 And thanks for sharing your picture, Esther!